For most beginners Phalaenopsis is the most rewarding plant because they thrive in conditions found in most homes. If you can grow African Violets you can grow Phalaenopsis orchids. In nature, most phalaenopsis orchids grow in dense forests with temperatures around 90 degrees during the day in the 70's at night. Unlike most orchids that grow high in the trees, phalaenopsis grow closer to the forest floor where they're shaded from the strong tropical sun. Because their natural growing environment matches the conditions found in most homes, they're easy to grow. And they don't ask for much. 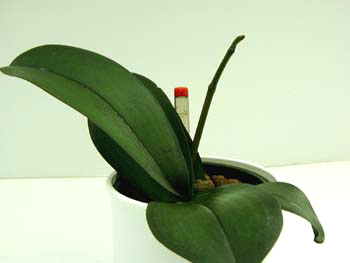 With their thick broad leaves, phalaenopsis also tolerates relatively low humidity levels found in most homes during the winter months. Just because Phalaenopsis are the only orchids you see in the stores, don't think for a minute that they're the only plants you can grow. Most phalaenopsis you'll find on the market today are hybrid plants, which makes them easy bloomers. All you need is a 10-15 degree difference between day and night temperatures to initiate a bloom cycle. They normally bloom in late winter or early spring with long, arching displays of big, colorful flowers that last 3 months or more! Harder to find are phaleanopsis species that bloom during the summer months with smaller star shaped flowers. Phalaenopsis also come in different sizes. 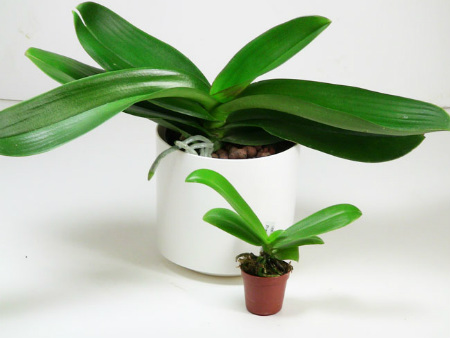 "Miniature Phals" are popular with many growers who have limited growing space. Care requirements are the same and both are excellent candidates for transplanting into hydroponics! Phalaenopsis don't demand as much light as most orchids. They're happy with bright light and maybe a touch of sun. An eastern exposure or western exposure is ideal. (If you're growing phals in a north window and they won't bloom, they probably need more light however.) Phalaenopsis are also good candidates for growing under lights. Phalaenopsis do not have water storing organs like many other orchids so their roots prefer even moisture without being too wet. Our Hydroponic System is perfect for this! As the LECA pebbles "wick up" the moisture up from the reservoir, air flows through the openings between the pebbles creating an even air/moisture mix. Note: Take care to no get water in the crown (where the new leaf is emerging). Standing water in the center will cause the new leaf to rot. 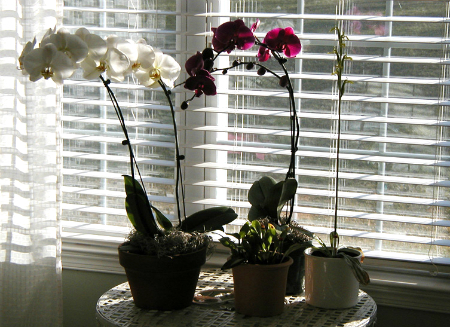 Phalaenopsis grow (and bloom) at temperatures found in most homes - with highs in the 90's and lows in the 60's. These plants are considered "warm growers" because they don't like temperatures lower than 55 degrees. They regress quickly if exposed to temperatures lower than 50 degrees. Humidity should be around 50% or more during the day (90% is ideal) and 30% is adequate at night. Our Hydroponic System provides added humidity but it's still a good idea to grow plants on humidity trays if your home is dry during winter months. Don't be alarmed if your plant was blooming when you brought it home and then it suddenly begins to loose it's flowers. Those blooms came from a nursery that could be thousands of miles away. Your new plant isn't dying, it's simply having difficulties adapting to its new home. After converting it to hydroponics, move it to a good growing spot and have the patience to wait for its next bloom cycle. The flowers you grow will be much stronger and last longer.